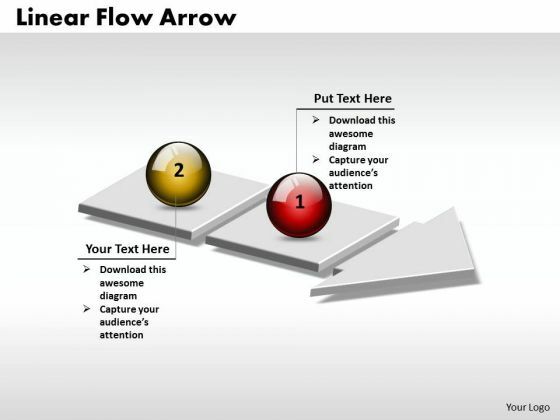 PPT 3d linear flow arrow Business 2 stages PowerPoint Templates-The theme of this PowerPoint template is linear arrows. Use them to illustrate a stepwise process or a phase structure.-PPT 3d linear flow arrow Business 2 stages PowerPoint Templates-Achievement, Arrow, Ascending, Ascension, Business, Concept, 2 Stages, Evolution, Illustration, Leader, Leadership, Progress, Red, Render, Rise, Rising, Sphere, Success, Team, White, Circle, Charts, Shapes Examine the causes with our Ppt 3d Linear Flow Arrow Business 2 Stages PowerPoint Templates. Let everyone know what's behind it all. We've helped thoudands deliver successful presentations with our Ppt 3d Linear Flow Arrow Business 2 Stages PowerPoint Templates. You'll always stay ahead of the game.